The 68-year-old soul singer was diagnosed with the illness in March, but signed up to headline Lovebox this summer, confident he would beat it. A message posted on Bobby's Facebook page has revealed that surgery to remove a tumour was successful, and that the tumour was not cancerous. 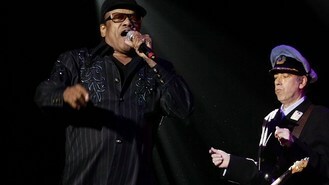 The statement said: "Bobby Womack has successfully undergone surgery for suspected colon cancer. A tumour was removed last night which turned out to be cancer free. We wish him all the best in his recovery from the operation. Thank you for all your kind messages and support." The singer gave an interview to The Guardian from his hospital bed before the operation. He said: "Bad as I been, I can sing my a** off, better than I could before. Maybe it's been preserved or something. If I can take control of my life from drugs, divorces, anything, I stand tall." Bobby's new album, The Bravest Man In The Universe, is set for release on June 11.